Our Favourite Cruising Destination – The Marlborough Sounds of New Zealand. New Zealand is such a wonderful place for cruising, so when I was approached by Look Insurance Services to choose my favourite cruising destinations in the world – I had trouble narrowing it down to just one! Many international cruisers visit New Zealand. It is a great place to hide out from the South Pacific tropical cyclone season which ‘officially’ occurs from the 1st of November through to the end of April each year. This also happens to coincide with our New Zealand summer! Many cruisers choose to stay around the beautiful Bay of Islands area or around the top of the North Island. There are undoubtedly some fantastic cruising grounds in that part of the country, but for those who are prepared to head a bit further South – you will not be disappointed when you reach the Marlborough Sounds. Located at the top of the South Island, the Marlborough Sounds has over 1500km of coastline – over 1/5 of the total of New Zealand’s coastline, so there are numerous bays and coves to discover. You are sure to find a secluded spot all to yourself. The maze of waterways is made up of three Sounds – the Queen Charlotte Sound, Keneperu and Pelorus. We sail up to the Sounds every year with a flotilla of other boats from Lyttelton. 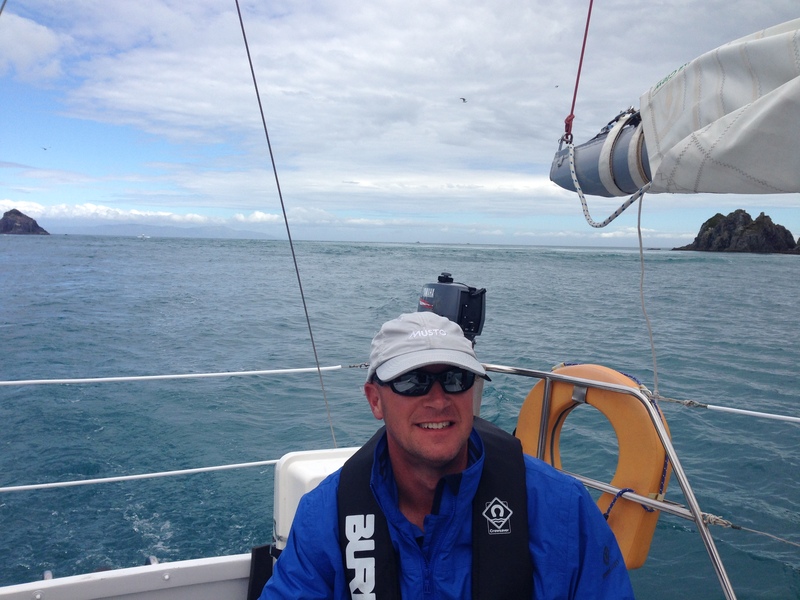 The 180 nautical mile trip usually takes us around 35 hours, and needs to be timed to coincide with a nice Southerly breeze to carry you up the coast – however you don’t want to be arriving in Cook Strait in a North Westerly storm! This body of water has been described as one of the roughest in the world, but it was like glass when we passed through last year, accompanied by a pod of friendly dolphins escorting us all the way. It isn’t always this calm! The next hurdle is navigating the entrance to Tory Channel. This narrow opening to the Sounds has a notorious tidal flow which can run at up to 7kts. When your boat is only doing 5kts it is not advisable to try and attempt to go against this current, which I found out last year and I am sure is the cause of the extra grey hair on my head. The relief to be through Tory Channel! However all that stress is well worth the effort, once the sheltered bush covered valleys and bays open in front of you, the sun comes out and you drop the anchor, dive over the side of the boat in to the crystal clear water and gather up some scallops, blue cod or crayfish for your dinner accompanied by a bottle of Marlborough Sauvignon Blanc – ahhh life is good! The bush clad mountains drop almost straight down in to the water, meaning that you need to anchor very close to shore and we usually also tie a stern line to a strong tree or rock. The deep water attracts all kinds of sea life, so don’t be surprised to see dolphins, orca and seals cruising nearby. There are so many different places to discover, you could be there for months and not see everything. But my favourite place to visit is Ships Cove. Captain Cook came here five times on his various voyages to New Zealand. He described it as a “very snug cove”. There is a monument here now and a track leading up to a waterfall in the valley. It is also the end of the Queen Charlotte five day walking track. Another wonderful destination is Furneaux Lodge. The lodge is named after Captain Tobias Furneaux who accompanied Captain Cook on his second voyage to New Zealand. The lodge is a great sailor’s hangout and has many moorings and a free water taxi service to bring you to shore. You can get showers, fill your dive tanks and have a lovely meal on the lawn overlooking the bay. The owner Geoff is also a sailor and will give you a warm welcome. I love to cruise around the bay on the paddle board looking for the stingrays bathing in the sunny shallows. Many bays are dotted with holiday homes, but as there are very few roads, most are only accessible by boat. 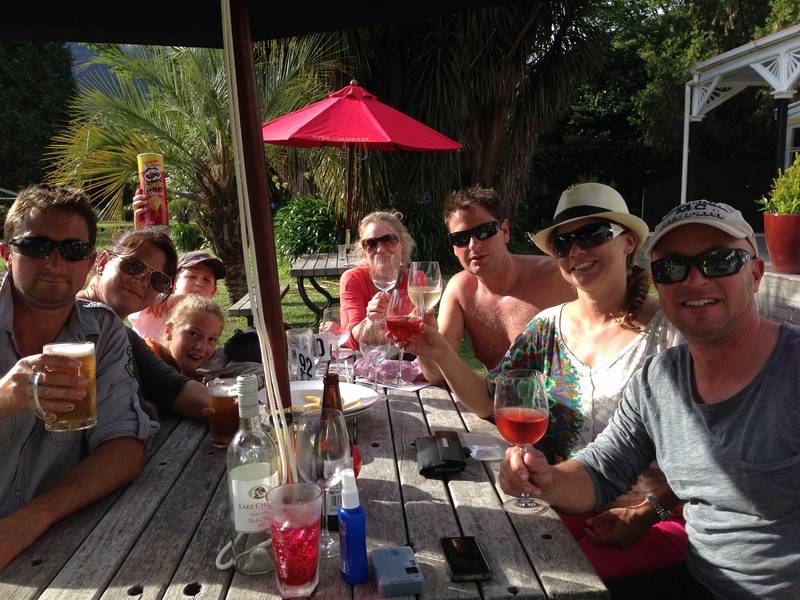 So if you want to re-provision, the best place to go is Waikawa Marina or Picton. Waikawa Marina is well set up with a fuel berth, haul out facilities and visitors berth’s. However Waikawa is about a five minute drive to Picton, which is where the supermarket is – the bonus is that both supermarkets do deliveries to boats. Picton is the home of the passenger ferries taking people and cars between the North and South Islands. This is where most of the shops are, however there doesn’t seem to be an easy place to leave the boat here, and the marina in Picton has a bridge which most yachts won’t fit under. So you could always drop the anchor in the Bay and head in to town on the dinghy. From Waikawa or Picton, the Grove Arm heads further inland and is dotted with more secluded bays. This is a great place to shelter if the weather is forecast to be bad. If it is good weather however, you might like to explore further afield, venture back out in to Cook Strait and across to the entrance of Pelorus and Kenepuru Sounds. We have yet to fully explore these beautiful inlets, and they are high on the ‘to do’ list. The other interesting place to visit is the remote D’urville Island, where the big blue cod need little encouragement to jump on to your fishing line and in to the pan! So in summary, if you love dramatic landscapes, crystal clear water, gathering your own food from the sea (be sure to check the fishing regulations before you do! 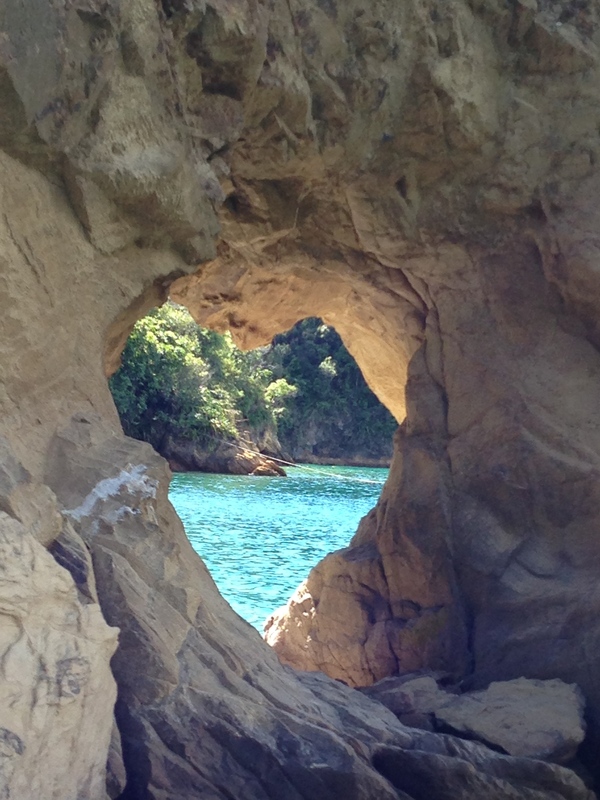 ), secluded bush covered coves and friendly people, then the Marlborough Sounds is the place to come! Thanks Look Insurance Services for encouraging us to share our little slice of paradise down here in the South Island of New Zealand. If you get to this part of the world, be sure to come and stay! New Zealand has always been the one place I have wanted to sail to. I don’t know why but looking at your wonderful photos and reading about the secluded bays and marine life just makes me want to go there more. One day we will get there and see these wonderful places you have shown us. Thank you again for an amazing blog. A lovely article and great pictures. I haven’t been there – yet…. 🙂 Now I must! We are driving up this weekend for a dive trip and will be sailing up in a few weeks time to deliver Wildy there for the Xmas holidays. Can’t wait! Beautiful photos and great tips on cruising this area 🙂 We were really sad that we didn’t make it down there when were in NZ—ended up working and then replacing our engine. Oh well, next time! We did make it down to Queen Charlotte Sound and camped on the shore there, gorgeous! Have a good trip! On the list for when we pull the plug on work! Looks gorgeous – a place I wish we could have gotten to when we were cruising in NZ! In all the time we spent in New Zealand, we never made it to the South Island in the boat . . . you just made me regret that even more! Great read, Viki! Viki, I love your story and pictures! I must get to the South Island in the future. So looking forward to N.I. In January. Hope to catch up with you someday! when i finally get to visit new zealand I really want to take in as much as I can. Such a stunningly beautiful corner of the Earth! I enjoy reading about your adventures!